This week we have drawn the Sail Boat card. This is a good reminder card for me as I tend to make up my mind I want to get something done and then nothing will stop me from completing the task. Sometimes it isn’t a wise idea, but I have had that idea and therefore it must be precious and acted upon!!!!! 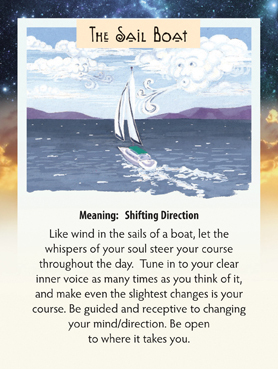 So this card is a reminder to “tune in” to your higher self now and then and check to see if you need to alter your coarse a bit…or even go a completely different direction. I had another project I was going to “get to press” as I thought I had been given enough “signs” that it was a good idea. I’m not sure what part of me thought it was such a great idea…but I suddenly realized it wasn’t so great after all! Tune in and listen this week. Ask if you are going the right direction, and if not, cut your loses! But do have fun…you are creating your life after all!